This study is conducted using the Methodology for Ecodesign of Energy-using products (MEErP) as established in 2011. This methodology was developed to allow evaluating whether and to which extent various energy-related products fulfil certain criteria according to Article 15 and Annex I and/or II of the Ecodesign Directive that make them eligible for implementing measures. 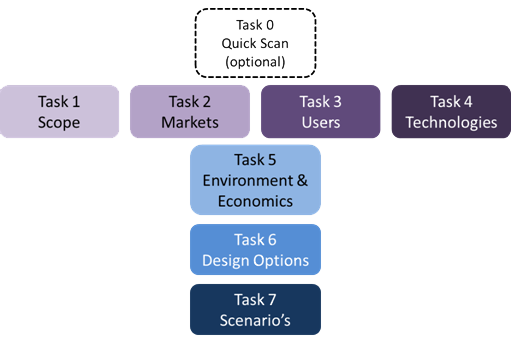 This methodology requires the contractor to carry out 7 tasks, ranging from product definition to policy scenario analysis. All (draft) documents will be freely available through this website. If you register as stakeholder you will receive notifications on website updates. Furthermore, as stakeholder, you can provide direct feedback to draft reports published on this website and make suggestions for energy-related products. Please note that your comments and suggestions may be made public on this website. You can also provide other non-public comments directly to the study team.